My theory has been that since the 2016 election the Fed has firmed its resolve to extricate itself from a dangerous situation; caught with its pants down as Trump/Republican fiscal (i.e. politically instigated) stimulus was going to be laid on top of already extreme monetary stimulus. I see a lot of post-FOMC articles out there talking about how Jerome Powell either does not know what he is doing or is an outright menace. Well, I can assure you he does know what he is doing and he’s only a menace if you are in his cross hairs. Here is a post-FOMC NFTRH update that I’ve decided to make public, as it does not go into much in the way of strategic planning or technical analysis but does get to the root of how I see the relationship between the Fed (and its long-term agenda) and the current administration (and its short-term agenda). I really do think we are onto something here. The dead-eyed (that’s a compliment) chief of the Fed just looked the market – and the president – in the eye and as cool as a cucumber, stated the Fed’s agenda. That agenda has appeared to be for the Fed to extricate itself from its bloated balance sheet and an untenable rise in long-term interest rates as a financial asset bubble roared on with fiscal (political) policy fanning the flames. Let’s go back in time to a decade ago. The credit bubble nurtured and overseen by Alan Greenspan was unwinding and that unwind was impulsive and to my eye, bent on complete liquidation of the system. Enter Ben Bernanke, TARP, ZIRP and QE (with a side order of Operation Twist). It was all financial engineering, all the time. It was monetary policy on steroids and with all those inputs it could only be a rabbit hole with new and intriguing possibilities… and no road maps showing the way out. I believe that the Fed did what it perceived it had to do because the Obama administration’s fiscal policy was a drag, not a stimulant to the economy. It filled a void by extending Bernanke’s emergency monetary policy and making it somehow routine (and making the gulf between the rich and not rich much wider). That was the scary part, the routine of it all. For about 2 years after the 2yr Treasury yield turned up they held ZIRP in the face of economic growth (ref. our 2013 Semiconductor Equipment up-cycle signal) and it made me think about distortions. 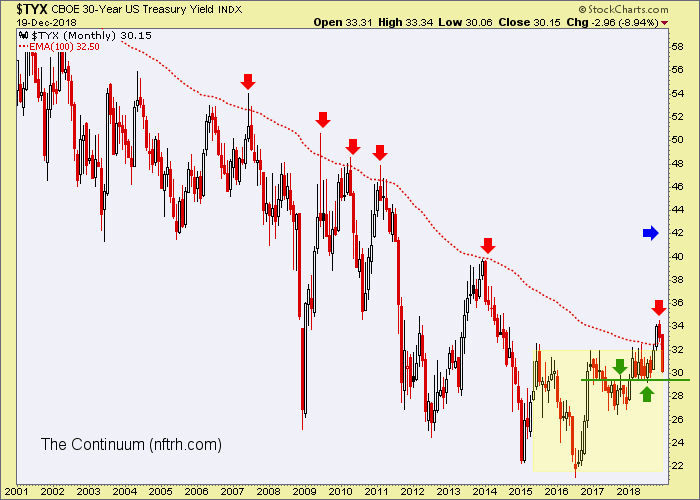 There is a reason I made such a big deal about the breakout and that was because something happened that has not happened in decades; the 30yr yield broke the EMA 100, closed October in breakout mode and remained there through November. And we wonder why the Fed is staying its course? As noted on several occasions in NFTRH and in public, the Fed is not for you, me, Trump or necessarily the stock market. Ultimately, the Fed is for the Fed and the Central Banking system and it was simply not going to fall on its sword and expire at the hands of breakout inflation, greed and asset bubbles all around. I continue to maintain that an impulsive breakout in yields (the blue arrow above shows the implied target of the yellow shaded pattern) would have blown the Fed’s racket. How do you maintain an orderly system of inflationary operation – that has endured through many decades – if bonds are burning and inflationary asset bubbles (most notably in stocks on the post-2008 bubble engineered by Bernanke-era monetary policy) are raging? The answer may well be, you don’t. I don’t like Donald Trump. I think he is a semi-lunatic, ruffian, delusional and divisive figure. But he and his policy (some of which would be positive in normal times) came around at precisely the wrong time as he and the Republicans laid the fiscal reflation on top of the monetary inflation (on steroids) that the Fed had instituted. In short, he is unwittingly in Mr. Powell’s cross hairs and no amount of whining on Twitter is going to change that. Did you see the dead eyes (again, a compliment in my view) on this guy? Steady as she goes. The Fed will save itself and then maybe someday down the road, try to save the economy. These are obviously my thoughts as they have evolved to this point and now, through the most important FOMC meeting I can remember. My thoughts are subject to my learning and my bias. Given that no single person can completely understand such a complex system, I ask that you take my views with a grain of salt (and correct me where/if needed). The stock market is technically broken, bounce or no bounce. We have been on that course for months now, with the January 2018 upside blow off designated as the sentiment-based “bull killer”. I am going to try to play it as best as possible (if the thing would just bounce I’d consider increasing shorts), but I don’t see this as a game. I don’t have a gambler’s constitution. This is a system purging itself (at best). Cash (paying another +.25%) remains the best option in my opinion. On the plus side, nothing – including yesterday’s rate increase – has hurt the progress of the precious metals and the gold miners. The macro and sector fundamentals have been rammed into gear with the stress in the global financial system, the impulsive drop in inflation expectations and gold’s out performance vs. cyclical and bubble assets. We continue to look toward Q1 2019 as an important time. The gold stocks are, as we have noted for years upon years of cyclical activity, counter-cyclical. They can be bought on opportunity with the understanding that patience through the process will be needed.